With September’s jam packed Month of Design behind us, it’s time to celebrate Oktoberfest with beer and brats. Royal Oak Farmer's Market is bringing a taste of Germany to Metro Detroit, this Saturday, the 14th. Get ready for a night of live music, games and a whole lot of beer. Over 50 breweries will be pouring their original recipes. From stout to indian pale ale, there’s something for everyone. My suggestion: DRESS UP. Wear dirndl or lederhosen and you’ll be the life of the party, like this guy with his eyes closed. A $15 ticket includes 7:30 PM admission, a commemorative pint glass and a keepsake photo. A VIP ticket is $20 and will get you in an hour earlier at 6:30 PM. Drink Tickets are $5 for 4 (3oz) samples and there is a special buy 5 Get 1 Free promotion! A hop, skip and a jump away in Ferndale, Axle Brewing Co.’s Livernois Tap is having an Oktoberfest celebration from noon to 11 PM. A $35 ticket includes two beers, an Axle stein, live music, and snacks. Throughout the day, Axel will be serving a German-influenced menu with pretzels, beer-braised brisket, bratwurst with sauerkraut, schnitzel, and more. 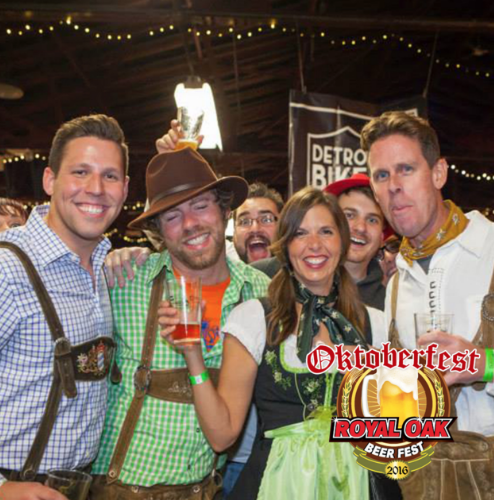 Craft Beer is taking over Eastern Market on October 27 & 28 at the 9th Annual Detroit Beer Festival. This is not an official “Oktoberfest” event per se, but we’re including it on our list for good measures. Tickets are $40-$45 and include 15 taster tokens. I was pleasantly surprised to see the festival sells $5 tickets for Designated Drivers, what a mindful idea! If beer is your drink of choice this is the festival for you. Over 800 craft beers will be on tap, showcasing the talent of almost 120 Michigan Breweries. Local musicians will be playing throughout the day. Food trucks and stands will be on site and ready to tame your drunchies. Eat, Dance, & Drink a lot of Beer. Can’t make it to these events, but still want to celebrate with some kraut? Host your own Oktoberfest party. Check out this site for inspiration!